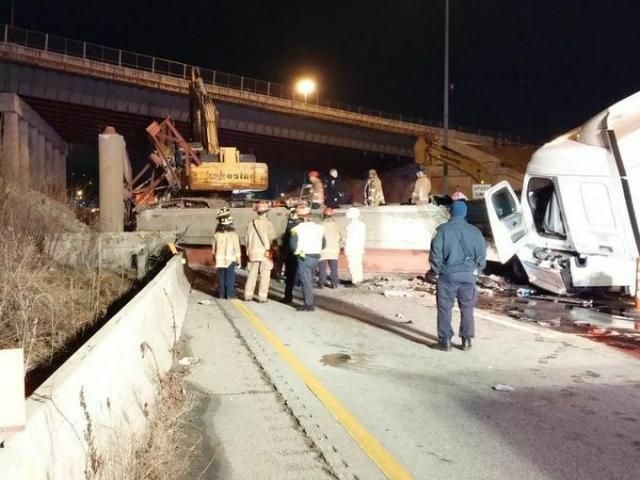 The Cincinnati Enquirer reports that on January 19, 2015, a bridge over I-75 collapsed about 10:30 PM in Camp Washington near Cincinnati, Ohio. According to the report, 1 construction worker is confirmed dead, a semi-truck driver was injured. The catastrophic pancake collapse happened on the old northbound exit ramp to Hopple Street, which was being prepared for demolition at the time of the collapse. The replacement bridge is already open. The semi-driver was injured when his rig collided with the rubble. Had he been a few seconds earlier, the results might have been quite different. "What appears to have happened is, in essence, an industrial incident – a workplace incident with respect to a construction crew that's doing work out here," city manager Harry Black said. "Something went wrong, and a tragedy has occurred as a result. ... We don't believe that there is any additional loss of life." City officials expect the highway to be closed for at least 48 hours while the investigation and cleanup takes place. Sorry, I'm the anonymous poster below. Although this type of cantilevered arm situation with pier spacings longer than available beams was remedied with pin and hanger systems on some bridges, this one had overlapped side-mounted brackets that used bolts to connect them together...this, coupled with the curved nature of the bridge, likely caused some eccentric forces due to the demolition process that sheared these bolts off and caused the collapse. Had there been gusset plates with multiple bolts instead, which is the most common form of connecting these beams that I've seen, this probably would not have been an issue. The photo below shows the street view of the failure point and the bracket and bolt system used. This would appear to be an accident that is a result of the bridge being demolished... in other words the problem probably is not so much of the bridge, but the method of demolition. My heart is with the family who lost a member last night. I know we like bridges, but we can't let them be unsafe.